In a small bowl whisk together the vinegars, garlic, basil, oregano, and rosemary and salt. Whisking slowly add the oil and whisk until emulsified. Set aside. 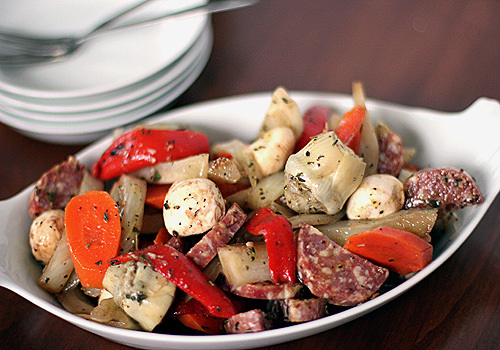 In a large bowl add the carrots, fennel, peppers, bocconcini, salami, artichokes, and the marinade. Mix until combined and coated. Season with crushed red pepper flakes, salt, and freshly ground black pepper. Chill in a covered container for at least 4 hours, preferably overnight. Bring to room temperature for 30 minutes before serving. Enjoy! this looks really great! I usually put out a charcuterie/cheese platter when I entertain, but this is another great alternative! Thank you:) Everyone raves when I serve it. I hope you give it a try. Thanks for stopping by. this looks like a great antipasto dish! i dont think I'd have trouble gobbling this up all by myself! I wouldn't want to share! I have to admit that it is very difficult to stop eating this. You'll find yourself saying, "Just one more bite" over and over again. Thanks for listing the brands you use ~ helps to get the dish "just right"! I made this for an appetizer for both Christmas Eve and Christmas day. It was a hit! So easy to make and the marinade smelled just incredible! Thanks for another great recipe, Nicole. thanks for the recommendation and you are so right about a good balsamic vinegar, it really does make a difference!